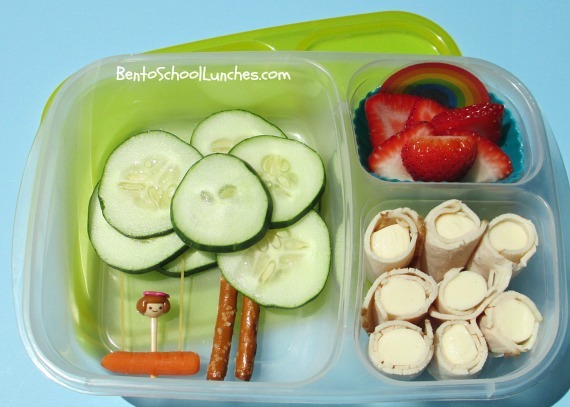 Summer fun is soon to come with time to enjoy a tree swing and I think this is just the sort of bento to set the mood. Tree of pretzel sticks and cucumber slices with swing of small carrot suspended by angel hair spaghetti with riding pick. Deli turkey rolled around Mozzarella string cheese. Strawberry slices with rainbow baran in silicon cup. Packed in our Easylunchboxes brights. The swing idea really tickles me :) cute! Very clever, I love your tree and swing! So cute! Love how you made the swing! So adorable! I love the little pick on the swing! Wonderful!